It was March and I was looking for a weekend trip destination. I was more than halfway through my semester abroad and had already made trips to places on my bucket list. Now I wanted something new and different, something I hadn’t thought of yet. It also happened to be my birthday. I don’t remember which brilliant friend of mine threw out the idea of going to Austria but I seconded the notion immediately, images of snow-topped mountains and warm apple desserts danced in my head. I used the birthday trump card and soon a small group of girlfriends and I were in our own sleeper cabin aboard a train to Vienna and then Salzburg for a three-day weekend. Visiting Austria in winter is a great way to appreciate a different side of Europe and the rich history of Austria is accented in the snowy surroundings. Vienna looks and feels every bit the classical European city so touted in textbooks. You feel as if Mozart could be at a bar just around the corner. The streets are winding and intricate but open, populated and clean. Our hostel, to our surprise and pleasure, was a homey apartment with a full kitchen. On student budgets, we made a trip to the local grocery store and made ourselves a fantastic meal from items we watched Viennese locals holding in checkout lines. The snowy mountains didn’t disappoint either. In Salzburg, we signed up for the official Sound of Music Tour that drives you via large and comfy tour bus between the original filming locations of the classic musical. And it’s every bit as magical as it sounds. We danced by the gazebo where the love stories of the film reach their tipping points. We saw the von Trapp house, a Downtown Abbey-sized estate that, at the time, was layered in late-spring snow. The gardens where Maria leads the children through “Do-Re-Mi” are elaborate, well-kept and regal. And the chapel where Maria and Captain von Trapp tie the knot is unreal, in a small village outside Salzburg where the mountains tower above the buildings to postcard-perfect heights. 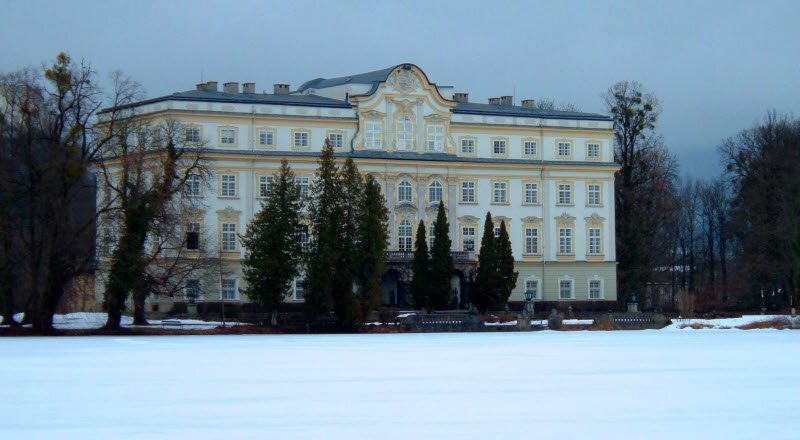 Beneath the snow the hills were alive with the sound of music and what a better way to step back in to a classic film than to be where the music can move you in the snow topped villas of Vienna! And even with all of this, for me, nothing could top the apple strudel. We ended the film tour in a light and charming bistro with simple and decadent, homemade apple strudel placed in front of each of us. Heavily topped with powdered sugar and caramelized to perfection, this treat is otherworldly – still steaming from the oven, a cozy, snowed-in mountain village visible but unbelievable, out the frosted windows.